In order to up their sales and revenues, savvy companies in the global guidewires market are expending time and money on research and development of better products having sophisticated features to cater to various medical procedures. The market is being currently driven by the rapid growth in the interventional procedures, growing per capita spends on healthcare, and, of course, constant product development by players. Proving detrimental to the global guidewires market, on the downside, is their high cost owing to significant time and money expended in research and development, and also because of their non-reusable nature. A report by Transparency Market Research predicts the global guidewires market to clock a steady CAGR of 6.2% during the period between 2017 and 2025 to become worth US$2.7 bn by 2025-end from US$1.6 bn in 2016. Product-wise, the main segments of the global guidewires market are coronary guidewires, peripheral guidewires, neurovascular guidewires, urology guidewires, radiology guidewires, gastroenterology guidewires, and other guidewires (otolaryngology and oncology). Among them, the segment of coronary guidewires account for maximum share in the market because of the alarming increase in instances of cardiovascular diseases, worldwide. Their demand is particularly high in developed countries where the interventional procedures such as percutaneous transluminal coronary angioplasty (PTCA) and percutaneous transluminal angioplasty (PTA) is comparatively higher. Besides, unveiling of better products from time to time is also boosting their uptake in the market. The peripheral guidewires form the second-most lucrative product segment because of the rising prevalence of peripheral artery diseases (PAD) resulting from changing lifestyles leading to high blood pressure, high cholesterol, and diabetes. Vis-à-vis growth rate, the urology guidewires will likely register a relatively higher CAGR on the back of new product launches every now and then, rising adoption of guidewires in interventional urology procedures, and growing patient pool for minimally invasive procedures. From a geographical perspective, North America currently holds a dominant share in the global guidewires market. The increasing instances of lifestyle-related diseases, increasing adoption of more sophisticated guidewires, soaring popularity of minimally invasive interventional procedures, and presence of numerous key players in the region have served to fillip the market. The region is expected to retain its dominant position in the near future too by rising at a CAGR of 5.8% in the forecast period. Europe trails North America, in terms of size, in the global guidewires market. The market in the region has been boosted primarily by a raft of product launches on account of the foray of foreign multinational players, favorable government policies, and a rising geriatric population. By registering a CAGR of 6.0% from 2017 to 2025, the Europe market is expected to attain a value of US$662.1 by 2025. In terms of growth rate, however, Asia Pacific is expected to outshine all other regions in the global guidewires market because of the increasing incidence of cardiovascular diseases, increasing healthcare expenditure in developing nations, and rising demand for affordable minimally invasive interventional procedures. Also majorly fuelling the market in the region is the rising number of local manufacturers of guidewires providing innovative products at lower costs. The region is expected to clock a CAGR of 7.0% from 2017 to 2025. Abbott, Terumo Medical Corporation, Integer Holdings Corporation, ASAHI INTECC CO., LTD., Olympus Corporation, Stryker, Cardinal Health, Inc., CONMED Corporation, Cook, Merit Medical Systems, Inc., Boston Scientific Corporation, and Medtronic are to name a few key players in the global guidewires market. This report studies the current as well as future prospects of the global guidewires market. Stakeholders of this report include companies and intermediaries engaged in the manufacture and commercialization of various guidewires, as well as new entrants planning to enter this market. This research study analyzes the global market for guidewires in terms of revenue (US$ Mn). For the research, 2016 has been considered as the base year and 2015 as the historical year, while all forecasts have been provided from 2017 to 2025. The global guidewires market has been studied on the basis of, product type, end-users, and their regional as well as national markets in terms of revenue (US$ Mn). The global guidewires market report comprises an elaborate executive summary that provides overall information about various segments of the market. The report provides a detailed competitive landscape, by major players operating in this market along with their shares (value %) of the global guidewires market for 2016. The report also provides detail company profiles of emerging market players operating in the global guidewires market. The market overview section comprises impact factors such as key market dynamics including drivers, restraints, and opportunities, affecting the demand for guidewires in the global market. These factors would aid the stakeholders in establishing a strong foothold in the global guidewires market. Furthermore, the market overview section comprises key industry events, product overview, and market attractiveness analysis in the guidewires market. The market attractiveness analysis provides a graphical view comparing the growth and market dynamics in various segments and countries to identify the most attractive market. The global guidewires market has been segmented as by product type, by end-user and by geography. 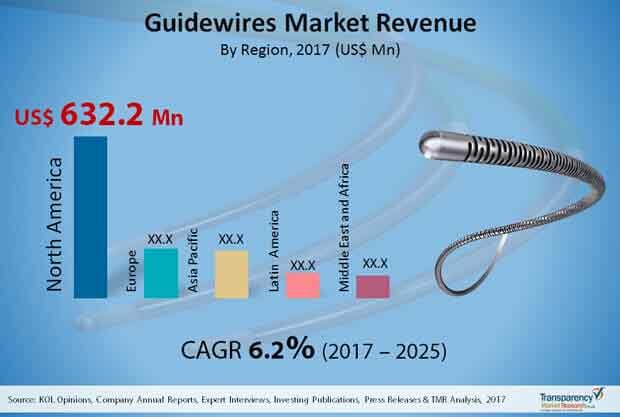 The global guidewires market by product type has been segmented into coronary guidewires, peripheral guidewires, neurovascular guidewires, urology guidewires, radiology guidewires, gastroenterology guidewires, and other guidewires (otolaryngology &oncology). The end-user segment is categorized into hospitals, clinics, ambulatory surgical centers, and diagnostic centers. Geographically, the global guidewires market has been categorized into North America, Europe, Asia Pacific, Latin America, and Middle East & Africa. Moreover, analysis for the major countries comprising U.S. Canada, Germany, France, U.K., Italy, Spain, Russia, China, Japan, India, Australia & New Zealand, Brazil, Mexico, South Africa, Israel, and GCC countries have also been provided in the report. A detailed qualitative analysis of the factors responsible for driving and restraining the growth of the guidewires market in various regions has been provided in this section. The report provides a detailed outline/blueprint of the guidewires market globally that will assist new companies in establishing their presence and market players in expanding their market share in the market. The report concludes with the company profile section which includes company overview, financial overview, SWOT analysis, product portfolio, business strategies and recent developments for market players. Major players having presence in the global guidewires market includes Abbott, Terumo Medical Corporation, Integer Holdings Corporation, ASAHI INTECC CO., LTD., B. Braun Melsungen AG, Olympus Corporation, Stryker, Cardinal Health, Inc., CONMED Corporation, Cook, Merit Medical Systems, Inc., Boston Scientific Corporation, and Medtronic. The emerging players in the global guidewires market includes Entellus Medical, Inc., EPflex Feinwerktechnik GmbH, and SP Medical A/S, among others.